Model CG3: developed especially for grinding nicks in cutting dies. 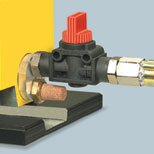 Pneumatic drive for high performance. The device has a patented attachment for pressing down rubber profiles. The damaging of the rubber during grinding is prevented, performance of the diecutter is optimized. Note: the device requires size 50 x 8 mm diamond grinding discs.